If you know someone who has been recently diagnosed with dementia or you are a carer for someone with dementia, the Department of Health want to know about your experience of the support you have received by completing an online survey. This questionnaire focuses on two key areas – the diagnosis process itself and the support you received after the diagnosis. The survey should take around 15 minutes to complete. The aim of the survey is to get a better idea of how services can be improved moving forwards. If this is an area you are passionate about and have more to say there will also be the opportunity for you to join the Dementia 2020 Citizens' Panel for England. 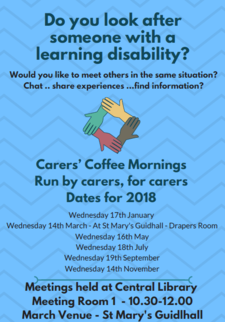 The carers' coffee mornings are now up and running for 2018. The group meets every other month at the Central Library in the city centre and is group for carers of adults with learning disabilities. It's a chance for carers to get together, have a cup of tea, share experiences and find out more about different areas of interest. In March there will be a change of venue as a one off. The meeting will be held at St Mary's Guildhall, Drapers Suite. The group is run by carers for carers. To find out more about the different groups for carers you can visit: Carers Groups Coventry.